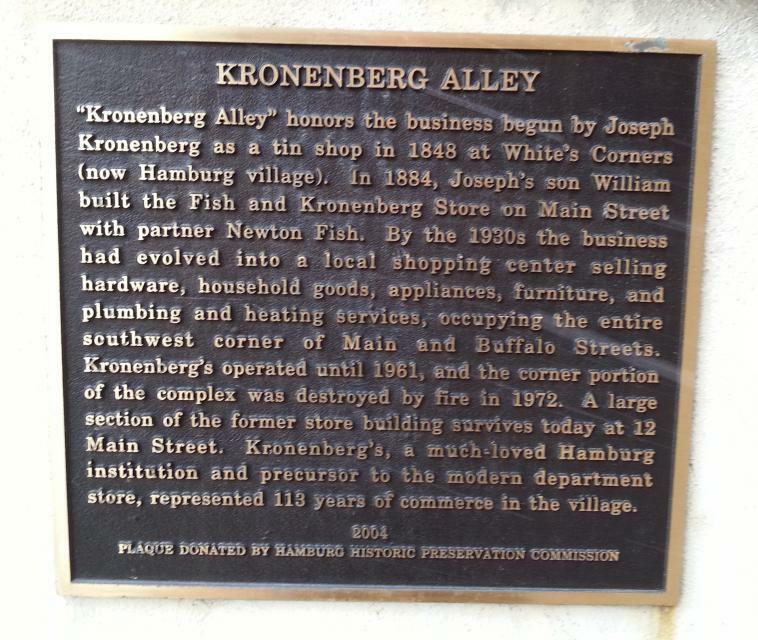 "Kronenberg Alley" honors the business begun by Joseph Kronenberg as a tim shop in 1848 at White's Corners (now Hamburg village). In 1848, Joseph's son William built the Fish and Kronenberg Store on Main Street with partner Newton Fish. By the 1930s the business had evolved onto a local shopping center selling hardware, household goods, appliances, furniture, and plumbing and heating services, occupying the entire southwest corner of Main and Buffalo Streets. Kronenburg's operated until 1961, and the corner portion of the complex was destroyed by fire in 1972. A large section of the former store building survives today as 12 Main Street. Kronenberg's, a much-loved Hamburg institution and precursor to the modern department store, represented 113 years of commerce in the village. This marker can also be identified by its HM code. You can use the hashtag #HM1K0X in tweets, and any other place where you might refer to this marker, including when searching on this site.